Practice is the last, but not necessarily the least step in learning to dance. Just knowing the steps is one thing, but making the dances work in a live setting is quite another. That is what our practice dance parties do. Our Practice Dance Parties aren't just for people who already know how to dance. They're for people just like you who are LEARNING to dance! 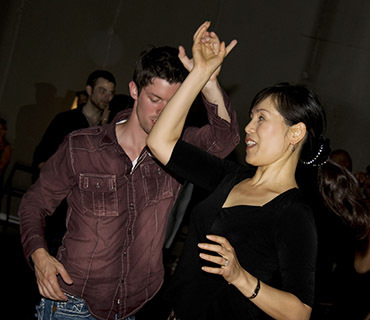 All of our instructors will be on hand to dance with students and help you along every step of the way. Practice Dance Parties are a special time of the week where we close the studio for dance lessons and our focus is on doing what we love the most. Dancing! We dim the lights, play popular dance music, and everyone gets to dance and practice what they've learned. No dance partner is ever necessary. There will be plenty of people on hand to dance with and our instructors will spend the evening dancing with our students as well.